The advantages of online training vs in-person training may best be understood by envisioning how each delivery model would be applied to a given business’s employee training requirements. Let’s say that a fictional company, “Sell Co.,” needs to hire two additional salespeople because it is rolling out an additional product. Each model will be discussed across a few dimensions: the trainer; the learner’s learning style; convenience, and cost. With in person training, the trainer must deliver the training separately each and every time an employee takes the training. In our example – let’s suppose that the product being rolled-out takes off and more salespeople are hired. 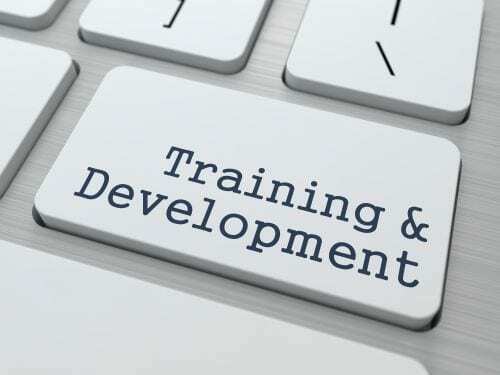 This means that the training must entirely be delivered over again, at roughly the same cost incurred to deliver the training the first time. This will be the case ad infinitum. However, with online training, the trainer only needs to design and create the training program once, and it can be delivered repeatedly. If the trainer is an outside contractor, this means that money will be saved on their compensation. If the trainer is an in-house employee, they will be free to do their work that relates directly to the business itself. 2. The learner’s learning style. Some learners need more time to process things as they are being taught, and the opportunity to go back over things subsequent to a training session. With online training, trainees navigate through the program at their own pace, and they have the opportunity to go back over the material when the main training session is over. However, when one is taking part in a group training session, he or she may be reluctant to get the trainer’s attention in order to slow down or repeat the concept. Furthermore, the trainer may be unavailable to revisit the material with the trainee subsequent to the training session. For example, if one of Sell Co.’s sales reps receives a response from a potential client that he or she doesn’t know how to respond to, he or she is free to refer back to the training program online. With online training platforms, trainees can conduct a training session wherever and whenever they have access to a computer with an Internet Connection. In-person training is subject to often inflexible scheduling. Suppose that the salespeople Sell Co. is hiring are inside sales rep that work from home. With in-person training, they would have to make a special trip to the company location purely for training purposes. Having to attend training at inconvenient times can make people enter training with a negative attitude, which mean they will retain less information. All of the aforementioned factors equal cost savings for your company. In particular; training will be more effective, meaning that your employees will be performing at a higher level. In the case at hand, this means increased revenue generated by your salespeople. As well, the cost of trainer’s time will be greatly reduced. In nearly every case, online training far outweighs the benefits of in-person training. For more information on how this can aid your company, talk to your expert staff today!